Description: Train 20 rolls down Division St. Description: Train 20 comes off the Fox River bridge. 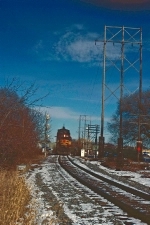 Description: Train 20 rolls through Oshkosh East. Description: SDL39 587 pulls its train off of the Barron line at Ladysmith. Description: In 2002 Wisconsin Central sold its SDL39 fleet to a group in Indiana, which eventually exported the rare type to Chile. 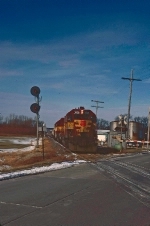 For a short period some carried out duties working freights for the shortline out of Connersville IN; here 587 heads north out of town with a string of auto boxes in tow.